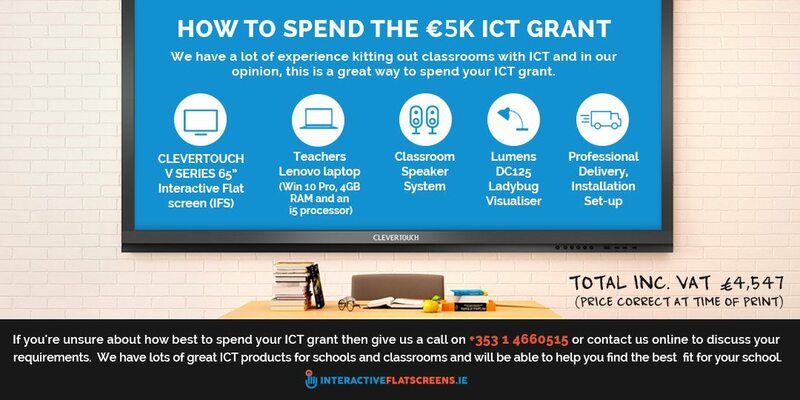 What Can I Get With My €5k ICT Grant? As we all know, there are so many tech options out there in the market it can be difficult to decide how to best spend the ICT grant. So many devices, hardware options, useful gadgets, and well….. not so useful gadgets. What do I buy? How can I get the most bang for my ICT buck? That is the million-dollar question or should I say the 5K question when it comes to the ICT Grant! We have a lot of experience kitting out classrooms with ICT and in our opinion, this is a great way to spend your ICT grant. This solution provides large screen Interactivity with Full HD Image quality. Easy Computer & Video display with enhanced audio and a desktop Gooseneck visualiser provides easy display of documents and objects on screen. The speakers can be used for audio playback from your i-device which provides great all round functionality. Whilst we think the above is one of the best ways to spend your ICT grant there are lots of other bits of great classroom technology available and some of the top sellers are below! State of the art classroom technology. Our best-selling product currently. Great Price/Performance ratio with a solid 5 year onsite warranty. Packed full of useful software, Android Operating platform, stunning full HD graphics, USB playback and inbuilt web browser. A single Clevertouch replaces a projector, an interactive whiteboard, classroom speakers, lots of cables and even operates without a laptop connected to it. When you see it in use, you see the future of classroom technology. A great all round refresh projector for existing interactive whiteboards. It offers excellent image quality, good brightness (2500 ANSI Lumens) and a 3 year warranty including the lamp (schools only). The best value projector on the market. When it comes to UST projection and interactive projection, EPSON own it. EPSON products speak for themselves. A great range of high quality projectors with a proven track record within the education sector. EPSON replacement projector lamps are also low cost. Warranties are 3 years including the lamp. If you are looking for the WOW factor, the CLEVERTOUCH PLUS is the answer. Strong, powerful and packed with all the great features of the V series as well as the comprehensive CLEVERSTORE APP Store which features over 150+ FREE educational high quality apps. The Plus series also features more internal memory and a high powered Android platform. If you are considering fitting out your school hall, make sure you talk to one of our hall install specialists. The NEC PA672W projector is the right tool for the job. It packs a punch at 6700 ANSI Lumens and displays a nice widescreen format WXGA resolution for a sharp and contemporary look. There is tons of connectivity on board, a range of lenses and it will stand up to the brightest of rooms. We have plenty of reference sites throughout the country with high quality school hall projection and sound systems of every size. 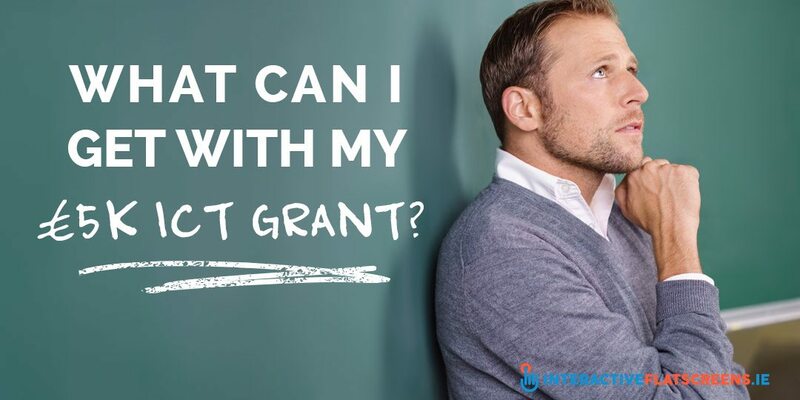 If you’re still unsure about how best to spend your ICT grant then give us a call on +353 1 4660515 or contact us online to discuss your requirements. We have lots of great ICT products for schools and classrooms and will be able to help you find the best fit for your school.